Earlier this week, the zoo lost one of its iconic animals. Our large alligator snapping turtle housed at Manatee Springs, Capone, passed away Tuesday evening. As his keepers, one of our favorite things to do was feed Capone with large crowds present. He would open that giant mouth and chomp his fish, quickly swallowing it whole. The collective gasp from the visitors could be heard from the keeper area and would always put a smile on my face. Capone was also a phenomenal teacher for our Zoo Academy students. We would let students offer his food, and the teenagers would nervously take the feeding pole after being told, “don’t drop the tongs”. Capone would come barreling toward the surface for his juicy herring. Sometimes the students would drop the fish (never the tongs), but eventually they would successfully give our massive turtle his dinner. It was such a boost of confidence for them, and Capone was infinitely patient. 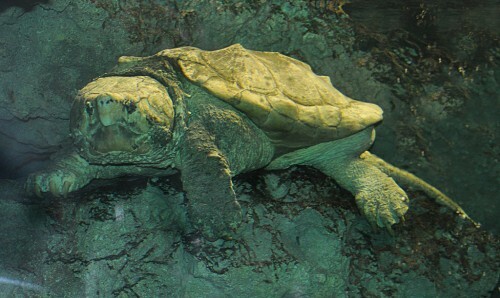 I’ve found conflicting information about the longevity of alligator snapping turtles, but most often have read that they can live to be anywhere from 50-100 years old. The keepers always considered him to be the old man of Manatee Springs. His ancient, dinosaur-like look also made him a favorite with our guests. One of the most common questions we would be asked was “how old is he?”. We weren’t ever really certain how old Capone was, but zoo lore told that he was one of the oldest animals in the zoo. He came here in 1998 for the opening of Manatee Springs. Capone always impressed visitors with his massive size. 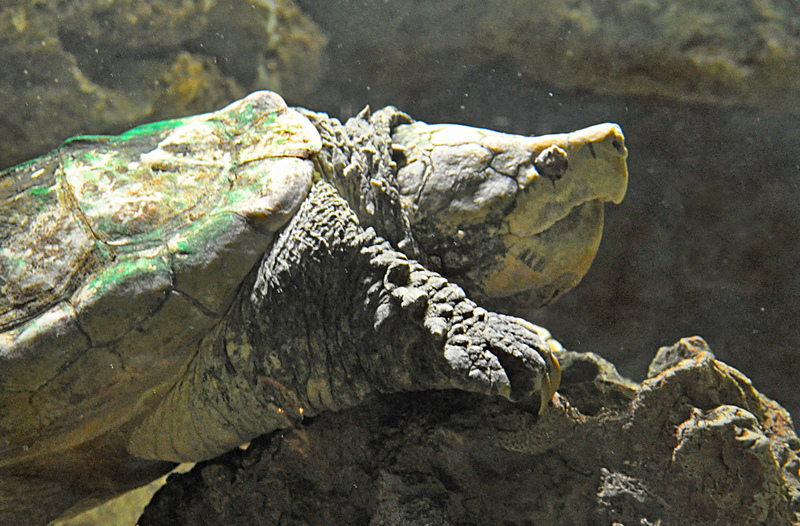 He weighed around 150-160 lbs., which is average for male snapping turtles. Some, however, can reach 200 lbs. This makes them the largest freshwater turtle in North America and one of the biggest freshwater turtles worldwide. Despite his size, he could really blend in which gave guests a huge surprise when they finally found him. Everybody who worked around Capone came to really love him. What he may have lacked in the “cute and cuddly” department (unless you ask me because I thought he was adorable), he made up for in charisma. He often would beg from keepers as they were working around his tank. In previous years he had been fed through some of the holes in the exhibit rockwork. Even long after he was fed that way, he would peak his massive head through one of the holes hoping for a treat. We will all miss Capone. I will miss Capone…he was the first “animal” I looked for at Manatee Springs. So sorry to hear about Capone. He will always have a special place in our family’s heart. My three kids loved trying to find him every time we came to the zoo. So happy we got to see him one last time on Monday. Sorry for you and the zoos loss. I’m sorry for your loss! My little girls loved Capone! Interesting enough I got the opportunity to show my daughters how Capone started this week as we found a baby snapper at work. I got the chance to hold it between my two fingers and take a snap shot. Thanks for what you all do! So sorry to lose such a wonderful turtle. my kids and i loved to watch him. they would talk to him through the glass and really believed that he was knew what they were talking about. Was he sick or do you think he died from old age? Turtles were always my favorite animal growing up, as I looked to them as symbol of toughness against things like bullying. This guy was therefore always my favorite animal in the zoo, especially outside the reptile house. This is one of those moments where I miss an animal as much as you would miss a person. Sorry to hear of his passing. Was wondering, I have a 17 year old alligator snapper who is outgrowing my ability to care fore him properly. Would the zoo be interested in adopting him, now that you are lacking one of his species. His name is Mean. And he is a beloved pet who has been captive raised. Please contact me if you are interested. I will definitely miss Capone. Whenever I’d stop at his exhibit, whether for a tour or just when I happened to be in the building and people were around, I always asked if they could find him, because he wasn’t always immediately visible to all. Whenever they did see him there would be gasps and exclamations. He was a sight to behold! So prehistoric looking. My nephew just told me this past weekend that he did a report for school on the alligator snapping turtles. I think he’ll be sad to know of Capone’s passing. I know I am. 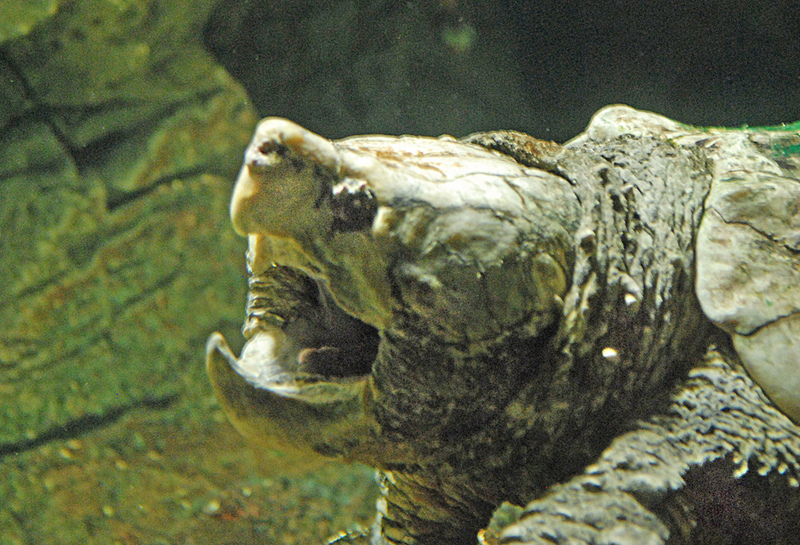 You should get a new alligator snapping turtle! We just got memberships, I would love to see another one make it’s home here.